Jack Neely, journalist, author and lecturer, will deliver the commencement address, titled “Maryville College at 200: An American Rarity,” to the Class of 2019 on May 4. Design majors Nate Kiernan ’19 and Lauren McCarter ’20 create innovative campaigns and animations and bring home the gold (ADDYs) from AAF-Knoxville. Commencement exercises for the Class of 2019 - MC's bicentennial class - will be held on May 4. Read more about the weekend! The MC community will celebrate Earth Day with a litter clean-up event, organic ice cream social, outdoor fitness opportunities and environmental sustainability activities. 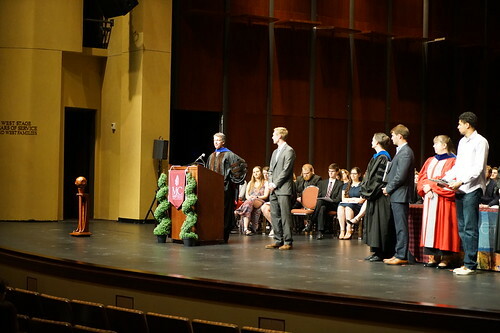 Scholarship and the ideals of the liberal arts were celebrated April 6, when 61 awards were presented to 72 students at Maryville College’s annual Academic Awards Ceremony. Maryville College provides students with a personal and total learning experience that prepares them for enriched lives as citizens, leaders and educated persons. Maryville College is committed to students' success. Follow the links below to access information that can help boost students' academic and professional development, as well as their physical, emotional and spiritual growth. Maryville College considers parents and families important partners in the education of students. These links provide family members with answers to questions regarding policies, events and deadlines, and they can connect with other parents of current students. Maryville College boasts more than 9,000 proud alumni who are making a positive difference in their communities and countries. Below are links to information that will help them stay connected to the College and each other. We’re grateful for this wonderful opportunity to introduce more Scots to Maryville College and are looking forward to May 18-19!